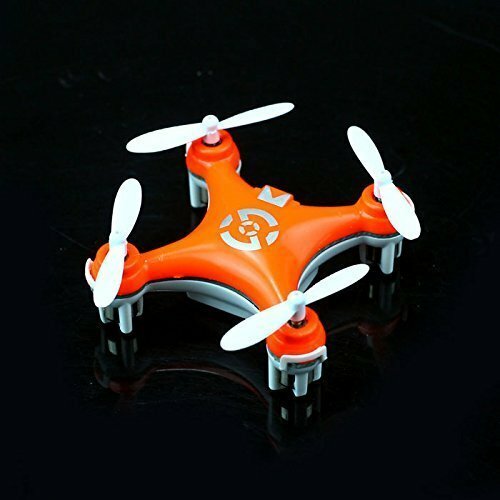 Finding the best mini quadcopter can be a challenging undertaking. There is a lot of information out there on drones but authenticating that information and being able to utilize it is the difficult task. From racing quadcopters to those with 4K and HD resolution there is a gamut of options in 2016. To help you make an informed choice, we have put together a list of the strongest contenders based on user recommendations. Enjoy the reading. 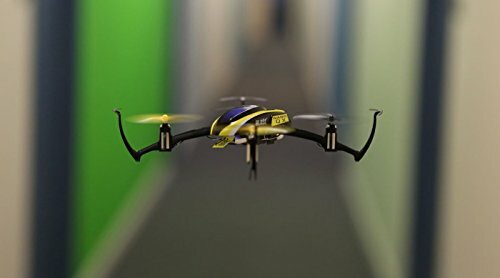 This mini quadcopter by Parrot features the best technology – the Bluetooth Smart Technology that enables it to be seamlessly connected with tablets and even smartphones. Parrot MiniDrone Rolling Spider also boasts unique and expansive prop-guard that protects during rough crashes. It, therefore, can be flown outdoors but only if the weather conditions are quite optimal. The complete pack, on the other hand, includes set of stickers, one removable 3.7-Volt 550mAh Li-Po battery, a quick-start guide, USB cable, two wheels and a transmitter. Controlled through the Free-Flight 3.0 App that can be downloaded for free on a smartphone or even a tablet with Bluetooth Smart technology. 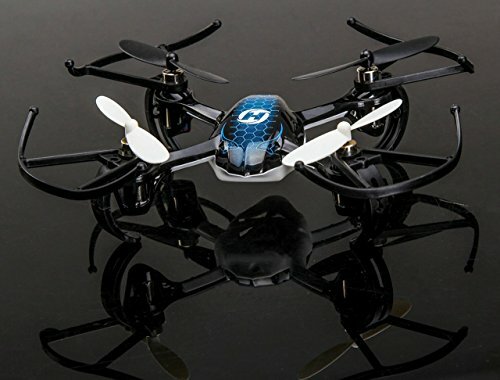 This mini quadcopter usually performs acrobatic 360-degrees front and back flips and can turn 90 and 180 degrees. Embedded vertical mini camera that takes photos of 300,000 px resolution allowing to take great aerial shots from the sky. 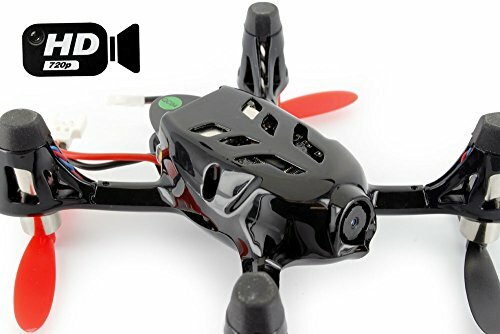 This is a great entry-level mini quadcopter for learning how to fly especially if you’ve never done so before while still enjoying the great FVP camera toy. 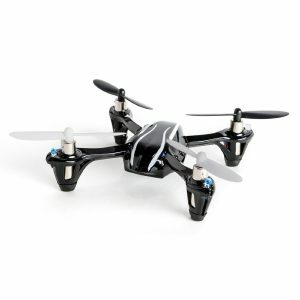 Hubsan X4 Quadcopter with FPV Camera Toy features a lightweight airframe that is very durable. The Hubsan package consists of four night LED lights, a USB charger and a 3.75-volt Li-Po battery that has an auto cut off safety PCB. The camera features 0.3-megapixel sensor and captures video at resolution 640 x 480 thereby giving you good quality videos. 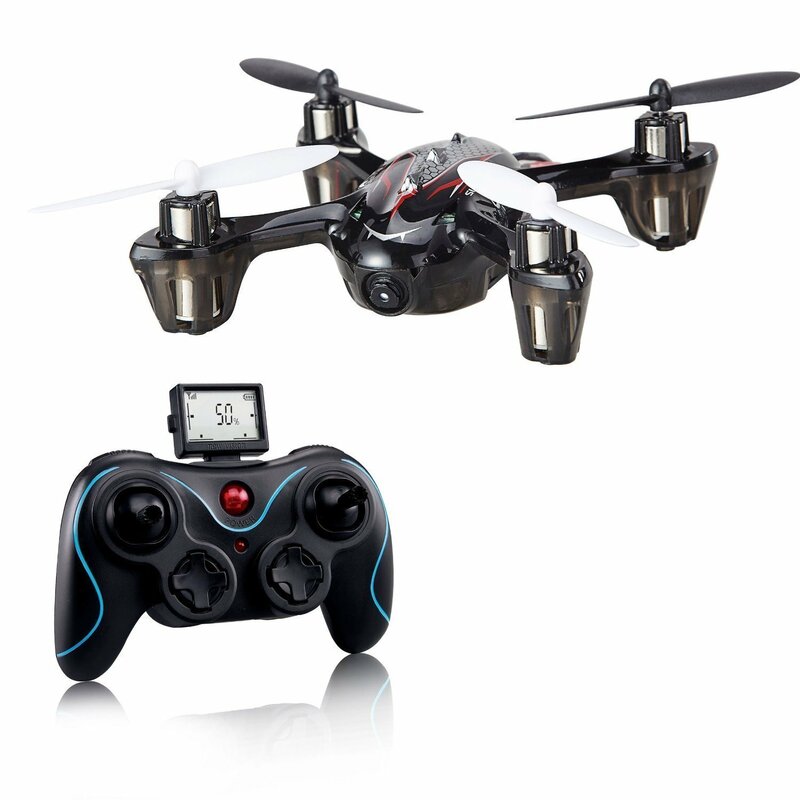 Features the latest six axis flight control system and a gyro sensitivity that is adjustable. This feature allows for super-stable flight, especially when flying outdoor. 2.4 GHz 4-Channel transmitter that gives you instant video preview anytime. Boasts 50meters to 100 meters control distance and around 100 meters distance for live video. 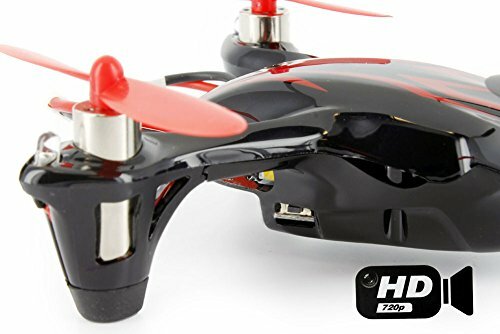 For a cheap beginner mini quadcopter, you cannot get much better than this H107C by Hubsan. It provides 9-minutes of flight time and 30-minutes of charging time. The package comes with a user manual, one quadcopter, USB cable, a remote control and four spare props. 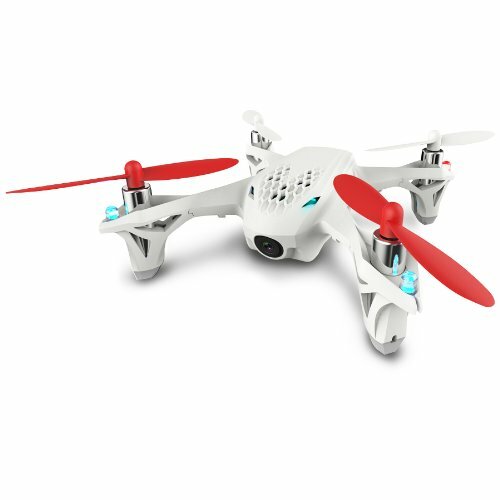 With this quadcopter, you can gain some experience with aerial photography or even use it to improve your flying skills. Although its recording quality is not the best out there, this quadcopter is still great for a small price tag. Uses 3.7-Volt 380mAh Li-Po battery. This is the universal battery-type used by RC quadcopters. 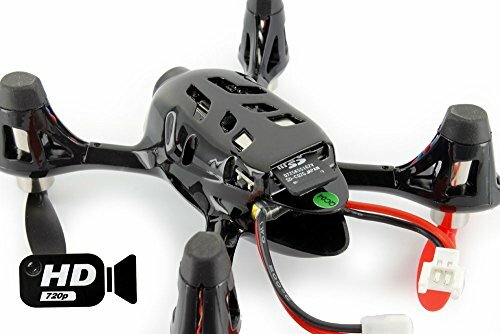 2.4GHz with 4-channels transmitter to allow you to fly your mini quadcopter without worrying about any kind of interference of any person who might be flying a model similar to yours nearby. Features four ways flip i.e. backward, right, left and forward and six-axis flight control system. The camera features 2 Megapixels which produces high-quality video. Two flying modes including the normal mode which is very stable hence ideal if it’s your first time to own a quadcopter and expert mode which gives you full speed. 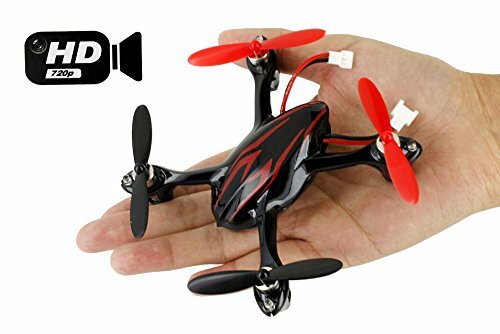 Finding a mini quadcopter can be a bit challenging with so many models available in the market. 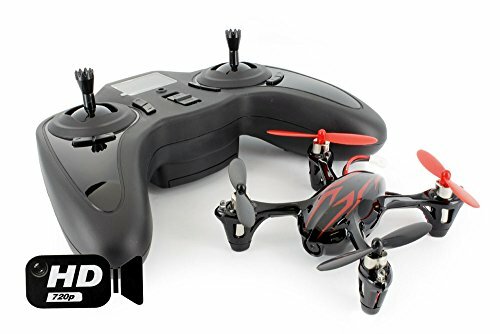 Thankfully there are still some models like Hubsan X4 H107L for example that manage to stand out from the crowd all thanks to its small size, great price tag, design and excellent quality. 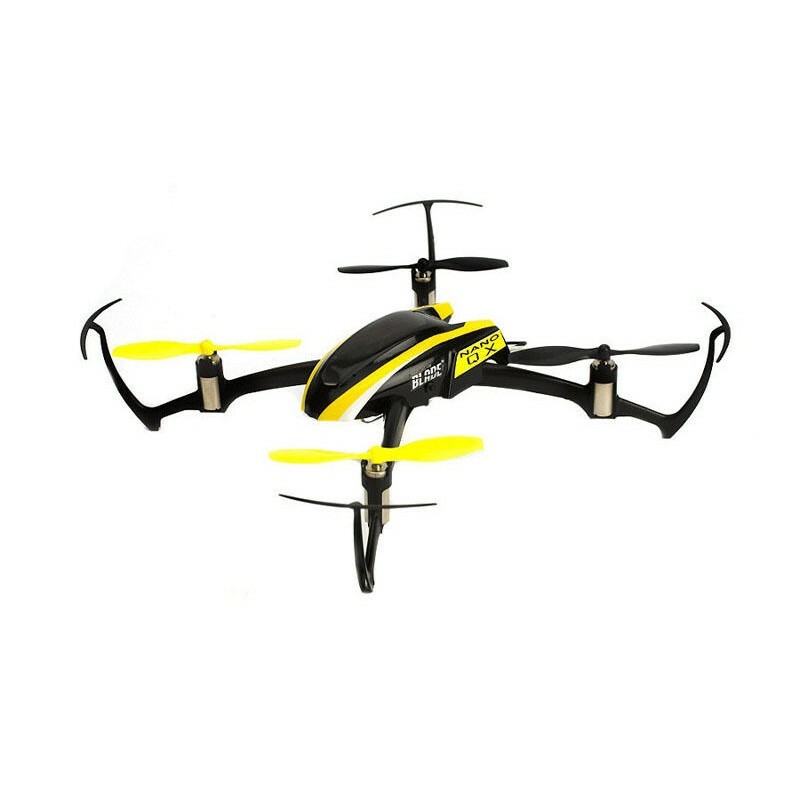 It features four channel 2.4 GHz controller and has a battery of 240mAH to give you pretty good flight experience. The camera performance is also good and will give you good quality video and images too. Has a six axis gyro that makes maneuvering this mini quadcopter much easier even in very harsh climate conditions. Powerful coreless motors and high-capacity 240mAh 3.7-Volt LiPO battery that is charged via a USB charger that is included in the package. Measures 2.3 inches by 2.3 inches by 1 inch while weighing 1.3 pounds only hence it is very compact and light-weight. 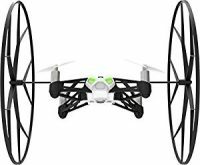 Featuring great design and quality performance, this a great mini quadcopter that is for anyone from beginners to experts who want to fly more insistently. 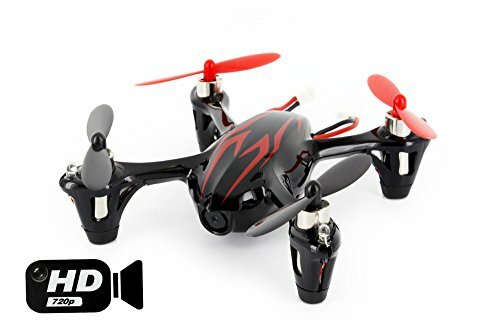 Holy Stone F180C Mini RC Quadcopter Drone with Camera 2.4GHz 6-Axis Gyro Bonus Battery and 8 Blades boasts great stability and assertive flying capabilities too even when submerged in the water fully before flying. 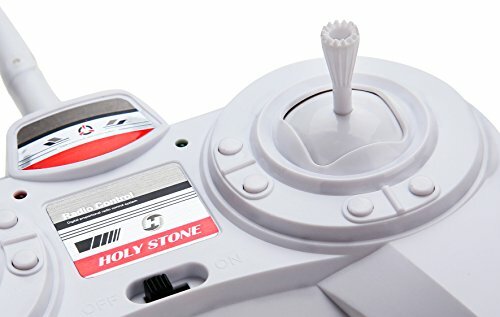 Holy Stone also has four levels of controls hence can perform very well both outdoors and indoors and is controlled by a six-axis gyroscope that offers extra flight stability. Comes with a video or photo camera with 1280 x 720 megapixels and four different sensitivity modes. The battery charging time is between 30 minutes and 50 minutes while the flight time ranges from six to eight minutes. 4 flying modes for 360 degrees flipping or hovering either right, front, left or back. 12 blades to give you a long period of flight time and a bonus stock battery too. The package also includes a user manual, USB cable, a transmitter and a 2G mini SD Card. Picture quality is not very good as you would expect given that the camera is rated at 720P. Fortunately, under good lighting, the quality is better. Glow in the Dark Paint Reviews — Why Do You Need One? 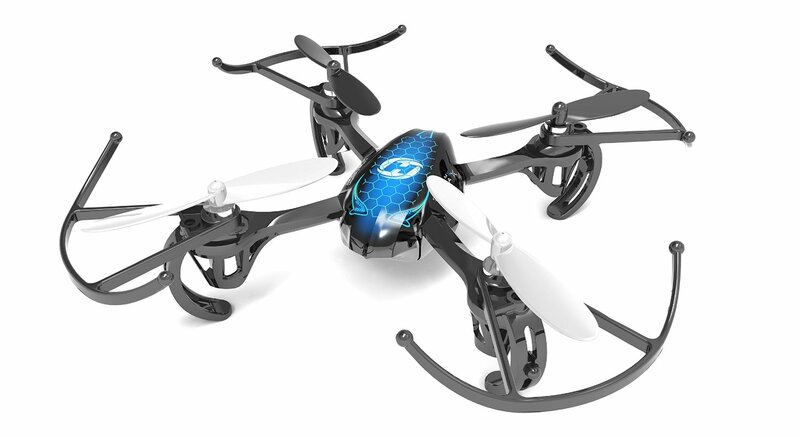 Thanks to this compact and light-weight mini quadcopter, flying just got a whole lot easier. The flight controller of this quadcopter features SAFE technology which means there are more sensors that can be easily configured to allow for more freedom of movement. This makes it a great choice for beginners and pros as well. Although Horizon Hobby Blade Nano QX RTF Quadcopter looks like such an over-sized bumblebee on the outside, this mini quadcopter has some of the best advanced features especially in terms of mid-flight stabilization. Features potent brushed motors that offer a powerful but very smooth lift. Stability and agility modes that enable you to do the most basic acrobatic flight. Four in one sensor unit that consists of the SAFE unit, multiple ESC drives, a DSMX receiver, and mixers. Airframe that is light-weight but very tough with blade guards. 4606 is more than just any other mini quadcopter. It is simple and to the point and has a LED light that indicates its front and back. Of course, this plays a big role when flying the copter in a dark room or at night. 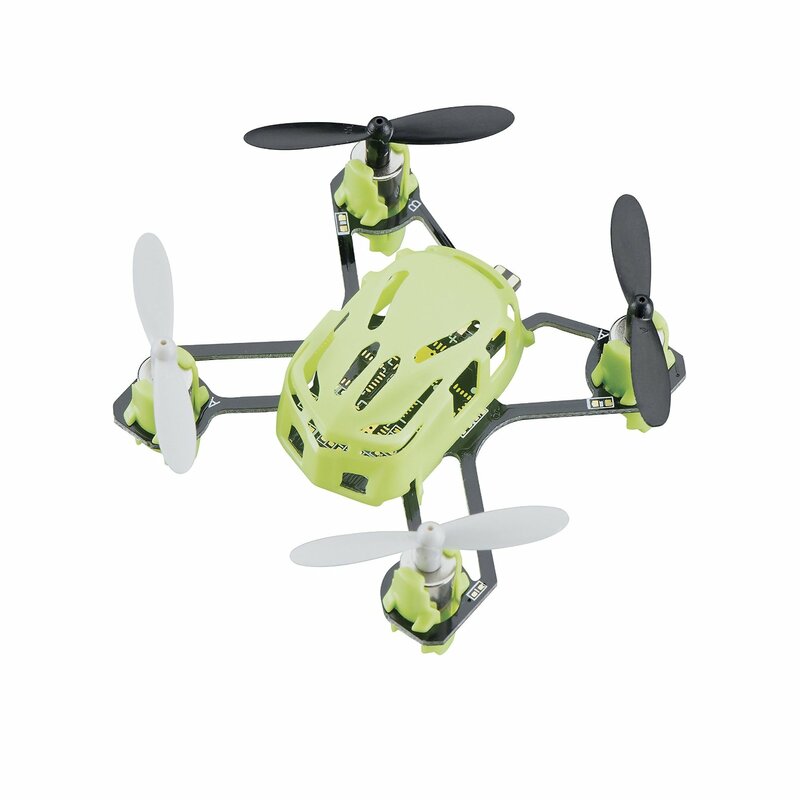 Estes 4606 can also fit in your hand, making it the smallest RC drone on the market today. But that notwithstanding, it has a sturdy frame that survives well against normal wear and tear forces. All in all, it has a beautifully understated design. 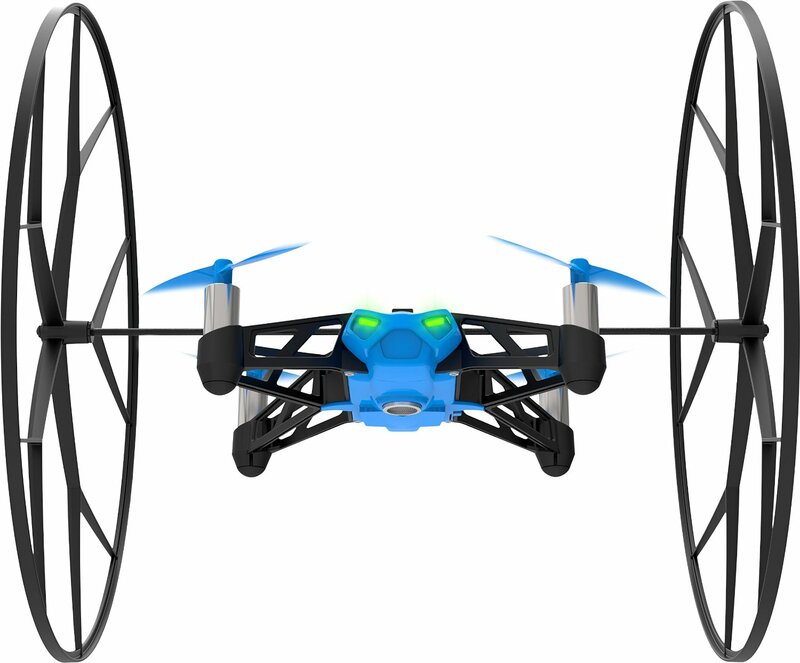 Sturdy frame with 4 micro motors that power the propellers efficiently. 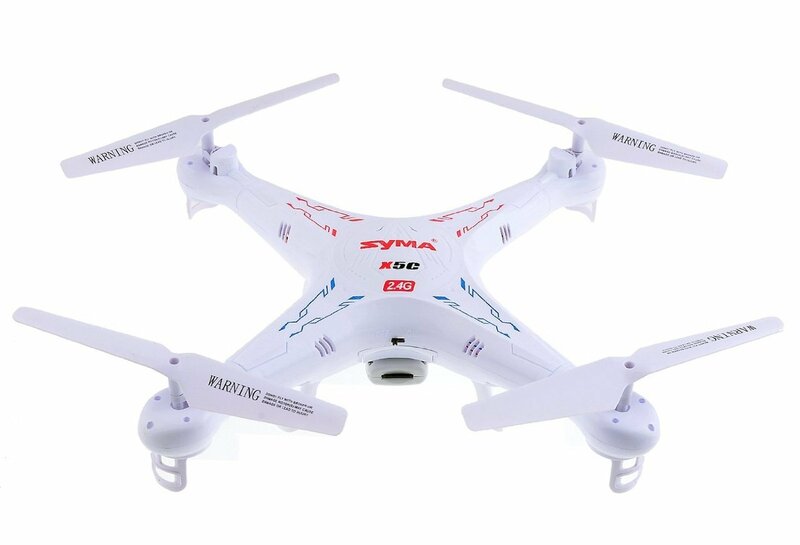 In addition, it comes with a remote control that operates at about 2.4 GHz minimizing interference during flight. Its average flight time is 5 minutes although there are some users who claim that it can clock up to 8 minutes. Keeping in mind that some of the larger quadcopters clock in around 7 minutes, it makes 4606 even more remarkable. Estes 4606 mini quadcopter standard charge time is 50 minutes. Taking into consideration charge time and flight time and comparing that with the full sized drones, the 4606 outshines them all. Note: Charged via USB. CX-10 Mini Quadcopter may be tiny, but it can outperform some of its bigger competitors on the market. It comes fully equipped with a USB cable, transmitter, spare blades and manual. Out of the box, there’s no assembly required – it’s ready to fly once you unpack it. 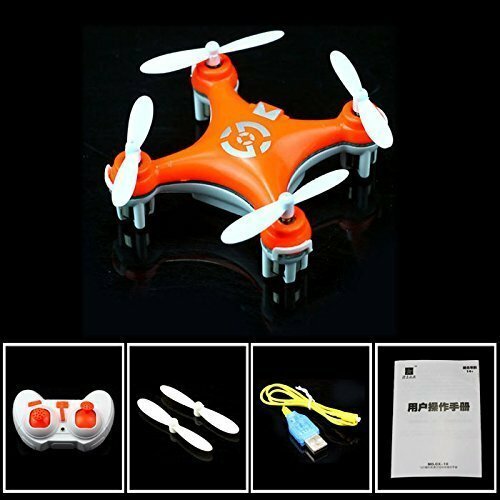 The mini-copter is designed to use a 100 mAh LiOn battery which comes together with the machine. This is a strong battery and it is usually enough to sustain all the four motors and give a bit of speed to the machine. 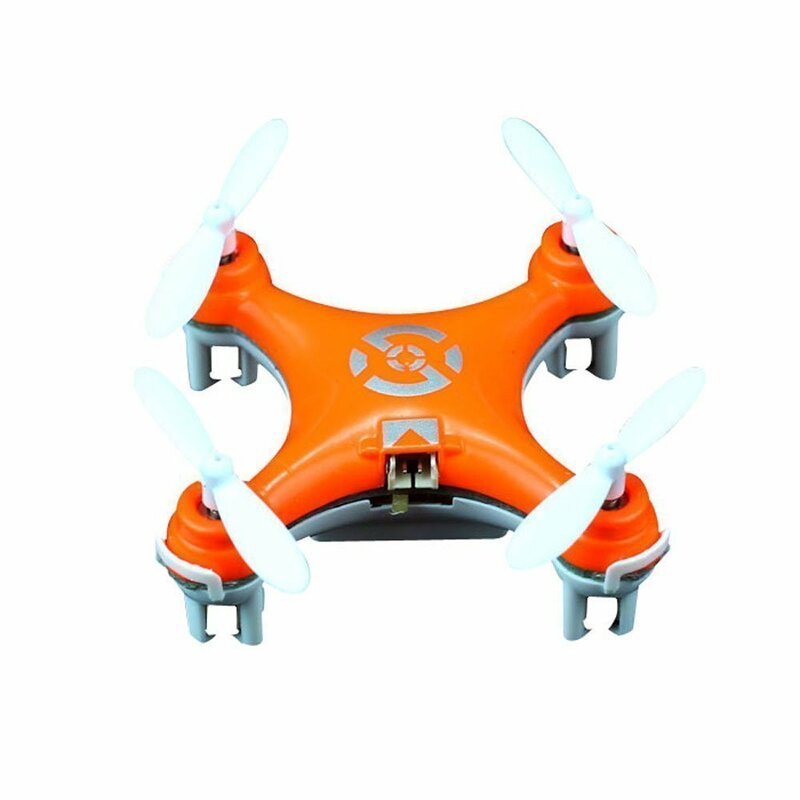 6 axis flight control board providing better stability and smoother flights. 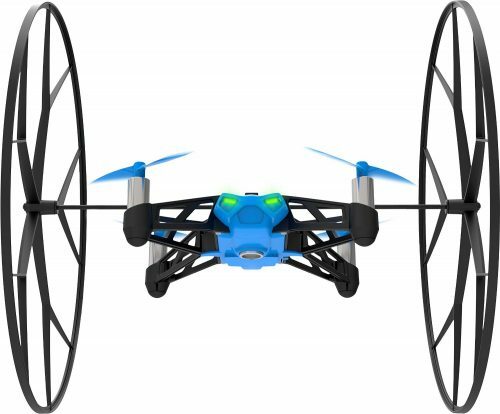 Basically, because this is a small quadcopter, the extra axes provide it with the ability to resist turbulence and maintain stability. Its frame is produced by ABS plastic which is strong enough to last against all forces of nature. Its blades are, however, made of light plastic and can be damaged much more easily. Has an average flight time in the range of 4 and 8 minutes. It can be charged in about 15 minutes using a phone or charger. 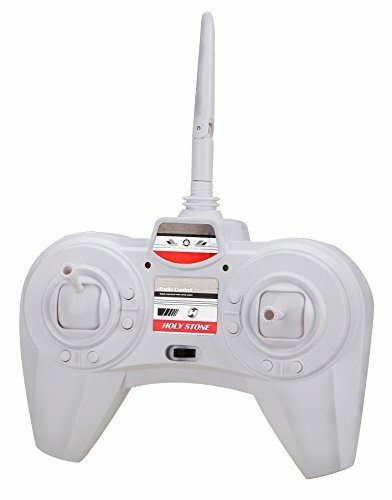 Its transmitter uses a 2.4 GHZ frequency which means you can comfortably control the mini quadcopter over a range of 65 to 165 feet. This astounding drone boasts a set of features that highlight it ahead of other entry-level quadcopters. 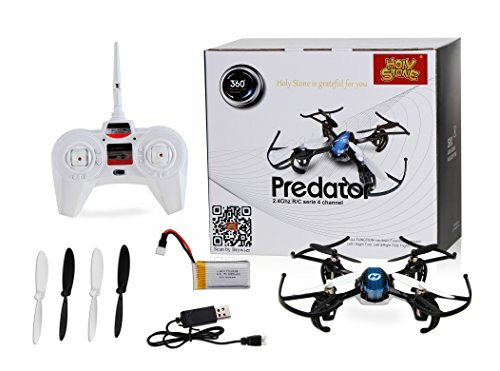 Holy Stone HS170 Predator Mini RC Helicopter Drone 2.4Ghz 6-Axis Gyro 4 Channels Quadcopter Good Choice for Drone Training has a headless security system that prevents it from veering off course or flying backwards. Besides that, its frame comes with additional protection to prevent the propellers especially from breaking down under the impact of day-to-day use. 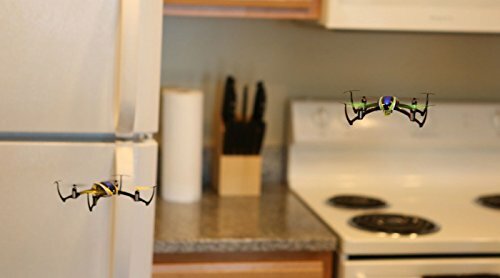 The mini quadcopter moreover executes four-way flips meaning that it can make 360 degrees turns in all directions – few entry-level drones can surpass this maneuverability. Holy Stone F181 further comes with two 750 mAh batteries which recharge in 1 hour 20 minutes. If properly recharged, this battery can achieve a flight time of 10 minutes. Has a user-friendly transmitter with adjustable settings based on LED display. The transmitter is designed to operate the copter’s Headless Security System making sure the pilot has full control of the drone. Comes with a relatively strong 720, 2 Megapixel camera that allows the drone to capture some nice photo shots from an aerial view. 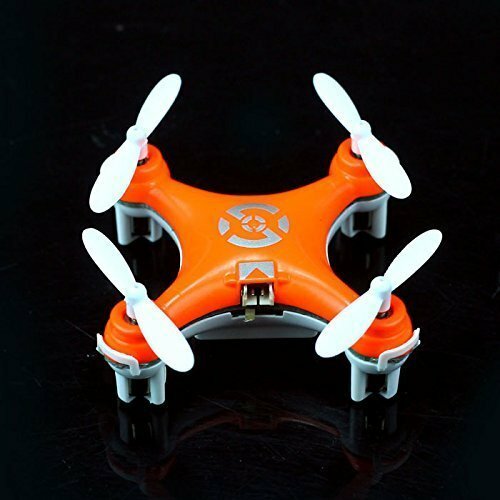 Mini quadcopter is further enhanced with a 4CH 6 axis Gyro which provides it with much-needed stability such that it can do both clockwise and anti-clockwise flips without the pilot worrying about it veering off control. 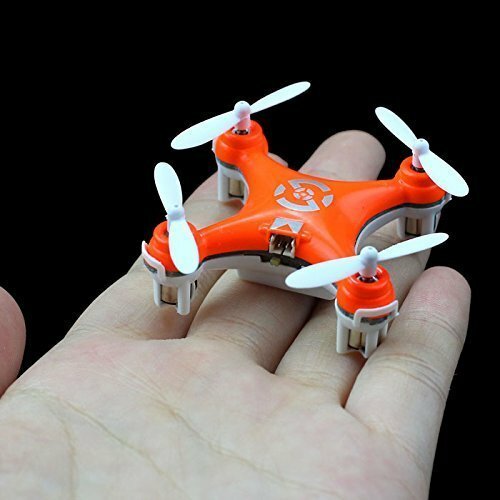 Measuring exactly 12 inches (length) by 12 inches(width) and 3 inches (height) and weighing about 2 pounds, this SYMA mini quadcopter is kind of agility and strength. Each unit comes completely assembled such that it is ready to fly right out of the box. In addition, there is a screwdriver included which you can use to replace any parts that get worn out with time. Below each propeller arm, there is a LED light with the forward arms spotting orange and rear ones spotting green lights. All of its blades are white which unfortunately makes tracking SYMA X5C Explorers 2.4G 4CH 6-Axis Gyro RC Quadcopter With HD Camera down much more difficult especially on a sunny day. Comes with a 500mAh lithium battery that takes about 100 minutes to recharge from ground zero. Once fully charged, the average flight time ranges anywhere between 6 minutes and 10 minutes. Has a remote control that uses 2.4GHz 4 channel frequency control through spread spectrum technology. The pilot, therefore, enjoys a wide control area of up 1o 150 feet. 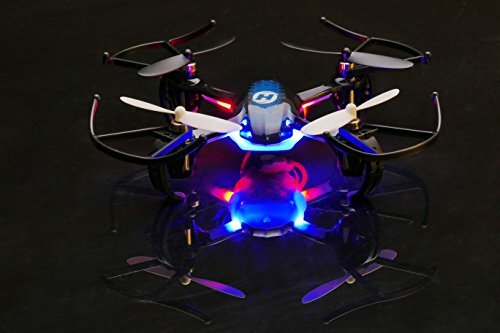 This mini quadcopter is highly sensitive to controls which make for some agile maneuverability with no land between hitting a control and the copter reacting. In addition, it has the anti-interference capability which blocks out other devices in the area. 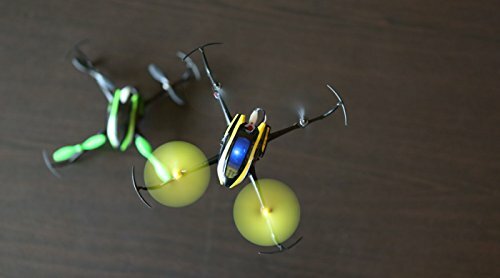 How to Choose a Mini Quadcopter? 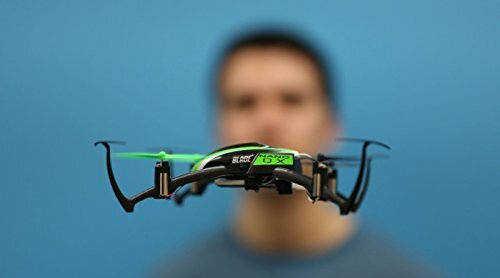 Perhaps the most important factor to consider when investing in a best mini quadcopter is flight time. Usually, a flight time of between 5 and 10 minutes is suitable. At the same time, you want to take into consideration the amount of time it takes to recharge the battery. The ideal recharge time is between 45 and 90 minutes. It’s also important to consider the camera. Ideally, the best camera for a mini quadrocopter is one with 720p and at least 2MP. However, if a high visual quality of images is your goal, consider going for a 5.0MP. You should take into account the type of controller provided as this is what determines how far you can fly it. The ideal controller for a mini quadcopter is one with 2.4GHz band. If you can find one with GPS sensors then that would definitely be a big advantage. 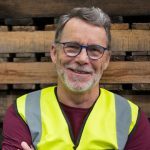 The last and possibly most important factor to consider is your skill level. Beginner flyers should stick to smaller quads with ready-to-fly features. 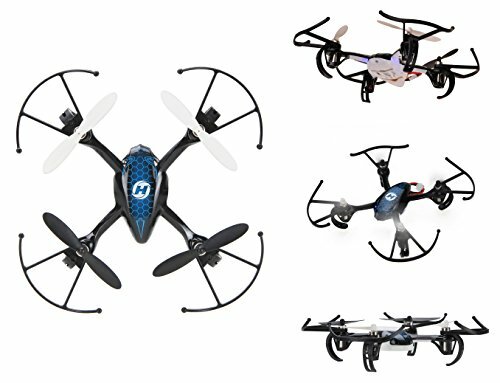 Comparing these 10 quadcopters, it is possible to identify one of them which offers the best deal. Our pick is Parrot Mini Quadcopter which has an extra smart technology and above average battery life. 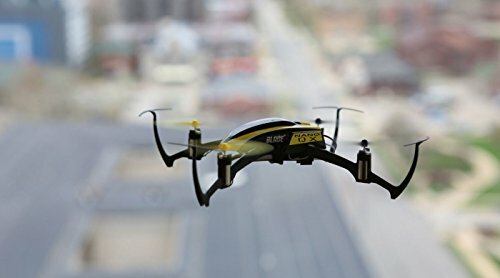 Parrot Mini-Drone offers great aerial shots and is optimized for outdoor flights all thanks to its prop-guards, added agility, and stability.